People starting or rekindling their passion for art ask the question should I do traditional art or digital art? Some also ask, is traditional art better than digital art and vice versa. For that reason, I wanted to share my thoughts on the subject. Personally, I do a mix of both and I'm always redefining my process but that's a topic for another day. 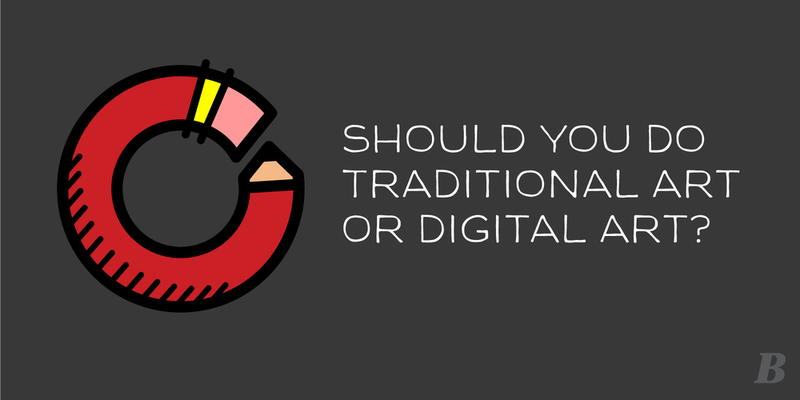 What’s the difference between traditional and digital art? The simple answer is traditional art uses traditional mediums that have existed and been developed and improved over time. While digital art uses digital technologies to produce art. There are a variety of factors you will take into consideration when determining what will work best for you. Below are lists of the advantages and disadvantages of each art format. Original Physical Artwork. An original piece of art is often considered worth more than a print or digital file. Imperfection. The flaws of art created by hand have a unique authentic value. Mistakes of hard to remove. Mistakes can’t be undone, only embraced or covered up. Difficult Reproduction Process. Requires a scanner or digital camera. Equipment/Materials. When you run out of something you need to buy more. More Efficient. Easier to get started and work quickly. More Forgiving. Nothing is permanent when you have the undo button. More Exploration. Unlimited experimental possibilities. Easier duplication. Ideal for working with clients. Equipment/Materials. After you buy your computer, software, and tablet you’re set. Unlimited Possibilities. Limitless possibilities can lead to creative paralysis. No Original Copy. No original physical copy. It can be printed on textured paper but it’s not the same as an original painting. Too Easy. Some say the undo button makes digital art too easy but I believe that’s a misconception. It still takes a great level of skill in the fundamentals of art to produce good digital work. When I was coming up with this list I started with opinions from my own experience but took a look around to see what other people had to say. I did my best to only use thoughts that were not heavily biased towards traditional or digital. Still digital came out on top with more advantages and an equal amount of disadvantages to traditional art. You can use the list of pros and cons of each medium listed above to help determine where you start or what you try next. There is no right or wrong answer but I do want to reiterate something I said earlier. It's a common misconception that digital art is easier because you can work more quickly and undo your mistakes. However, it still takes a great understanding of the fundamentals of art to produce good digital work. Another thing to consider is that in many ways digital art an imitation of traditional. A friend of mine who happens to be an amazing traditional artist told me he experimented with his oils and acrylics for hours to figure out how to emulate a glowing fog effect that he saw on a digital painting. You can develop your fundamentals traditionally or digitally but to have such a grasp on how to physically manipulate color and light is only going to benefit you when you step into the digital world. It’s all a matter of what’s readily available to you. If you have access to a computer with a graphics tablet and software for creating digital art start there. If not, art supplies can add up but if you’re smart about how and when you buy your materials it can be fairly inexpensive. Here are some thoughts on traditional and digital art from a couple of artists I admire. As you continue down your artistic path it’s also important to experiment with your process and find out what works best for you. I hope I’ve been able to provide some food for thought on the subject of traditional versus digital art. Feel free to share your thoughts below in the comments.